DIE Martis, 15 die Januarii. Persons took the Oaths in order to Naturalization. 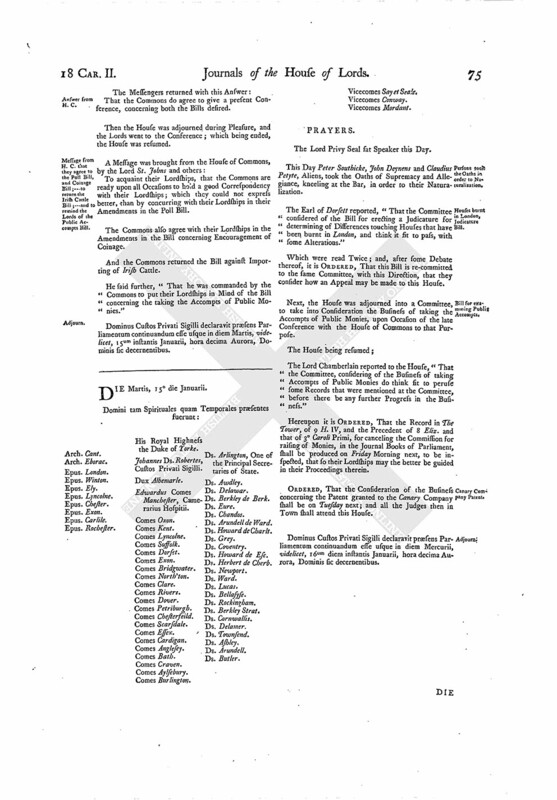 Houses burnt in London, Judicature Bill. Bill for examining Public Accompts. The Lord Privy Seal sat Speaker this Day. This Day Peter Southicke, John Deynens and Claudius Petyte, Aliens, took the Oaths of Supremacy and Allegiance, kneeling at the Bar, in order to their Naturalization. The Earl of Dorsett reported, "That the Committee considered of the Bill for erecting a Judicature for determining of Differences touching Houses that have been burnt in London, and think it fit to pass, with some Alterations." Which were read Twice; and, after some Debate thereof, it is ORDERED, That this Bill is re-committed to the same Committee, with this Direction, that they consider how an Appeal may be made to this House. 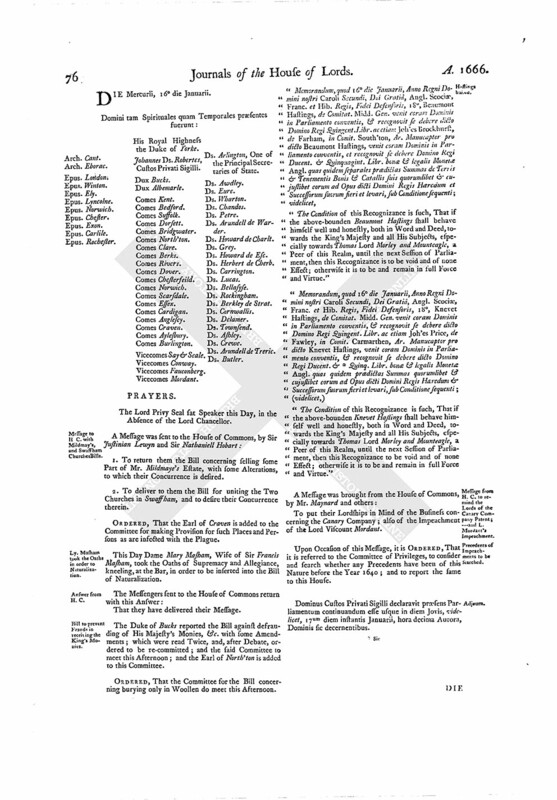 Next, the House was adjourned into a Committee, to take into Consideration the Business of taking the Accompts of Public Monies, upon Occasion of the late Conference with the House of Commons to that Purpose. The Lord Chamberlain reported to the House, "That the Committee, considering of the Business of taking Accompts of Public Monies do think fit to peruse some Records that were mentioned at the Committee, before there be any further Progress in the Business." Hereupon it is ORDERED, That the Record in The Tower, of 9 H. IV, and the Precedent of 8 Eliz. and that of 3° Caroli Primi, for canceling the Commission for raising of Monies, in the Journal Books of Parliament, shall be produced on Friday Morning next, to be inspected, that so their Lordships may the better be guided in their Proceedings therein. ORDERED, That the Consideration of the Business concerning the Patent granted to the Canary Company shall be on Tuesday next; and all the Judges then in Town shall attend this House. Dominus Custos Privati Sigilli declaravit præsens Parliamentum continuandum esse usque in diem Mercurii, videlicet, 16um diem instantis Januarii, hora decima Aurora, Dominis sic decernentibus.